The Apollo Theatre opened in 1901 with a production of American Musical comedy, The Belle of Bohemia. 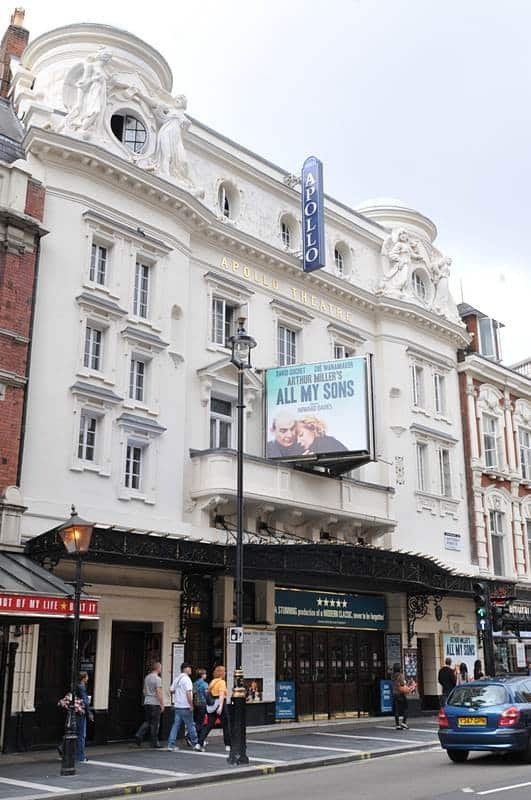 A fitting opening show, as the building (the fourth theatre to be built on Shaftesbury Avenue) was constructed as a venue for musical performances. Musical comedies ran in the Apollo until 1912, when a policy change allowed a greater variety of work to be performed in the theatre. This saw productions from such respected writers as Sean O’Casey, Ivor Novello, Noel Coward, and Terrance Rattigan. The Apollo had a private foyer and anteroom installed to the Royal Box during its renovation by Schaufelberg in 1932, but the theatre has remained largely unchanged since. The theatre saw one of its most successful productions in 1962 with Boeing Boeing, which eventually transferred to the duchess in 1965. Only a few years later, Sir John Gielgud performed in Alan Bennet’s Forty Years On to great praise (he would later come back to the Apollo to make one of his last stage appearances in 1988). The Stoll Moss Group purchased the theatre in 1975 and sold it to Really Useful Group and Bridgepoint Capital in 2000. In 2005, Nica Burns and Max Weitzenhoffer purchased the Apollo and formed Nimax Theatres. 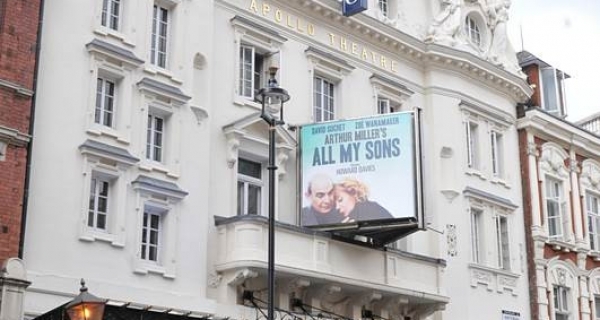 The early 21st century has seen the Apollo host renowned plays such as All My Sons (with David Suchet), the universally acclaimed Jerusalem (which, on top of two successful seasons at the Apollo, moved to further triumph on Broadway), and the award-winning production of The Curious Incident of the Dog in the Night-Time. Just before Christmas 2013, during a performance of The Curious Incident Of The Dog In The Night-Time a section of the ceiling collapsed closing the theatre for several months. The collapse was blamed on the aging Victorian architecture. Let The Right One In re-opened the theatre with a false ceiling concealing the damage and removing the top balcony from use whilst repairs were instigated. A wheelchair access entrance and platform lift is available. 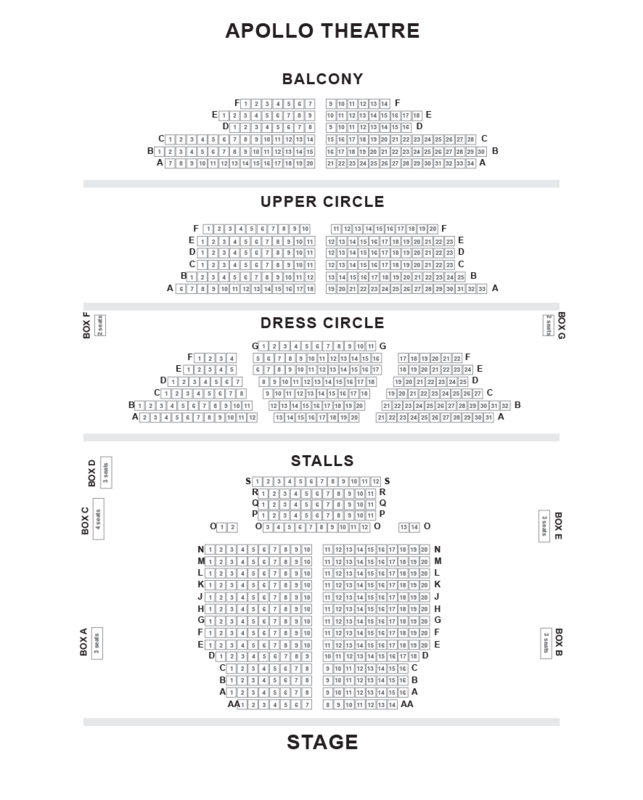 A fully equipped adapted toilet is available at the rear of the stalls. There is an infrared system working throughout the auditorium with conventional headsets. Headsets are available on a first come first served basis. Guide dogs and hearing dogs are permitted in the auditorium and staff can dog sit by prior arrangement. Advance booking is recommended.